We drove up the winding and narrow streets of the Hollywood Hills, all the way to a dead end and meandered into the open door of a breathtaking home where the Darling x UGG Dinner curated by Darling and Chelsea Carter Events was set. Built into the side of the mountain with wide spanning views, this beautiful home was provided to us by Tripping.com. The breezeway in the entrance was lined with uniform linen tote swag bags with hand-lettered names on them for the guests and we couldn’t wait to see what was inside upon leaving. Guests started to arrive dressed in chic, casual spring outfits, welcomed by cocktails created by Sip in LA, wine provided by Rasi and delicious kombucha by the lovely Boochcraft, all leading up to Chef Lee Tilghman’s gorgeous table of appetizers. On the cheese plate was an array of farmer’s market fruits and veggies nested between cumin black bean dip with roasted za’atar beet hummus. Between being almost all new friends and taking in all of the beauty around us, we were hesitant to dig into Chef Tilghman’s work of art. However, we quickly got over the restraint to enjoy coconut oil candied nuts, truffle almonds, olives, sheep’s milk brie, manchego and rosemary olive/ paleo crackers for dipping sprinkled throughout the entire spread. If that wouldn’t break the ice with strangers, I don’t know what could! Down the steps from the kitchen, the great room with wall to wall windows let in the last golden light of the day and guests mingled about a large suspended balcony that looked over the entire city. Guests rushed to get in that last perfect Instagram shot and Cara Robbins made sure to catch the moments in polaroids and professional photography. The home was filled with laughter and the sound of people meeting for the first time — complimenting outfits, making connections and reveling at the beauty of this place. 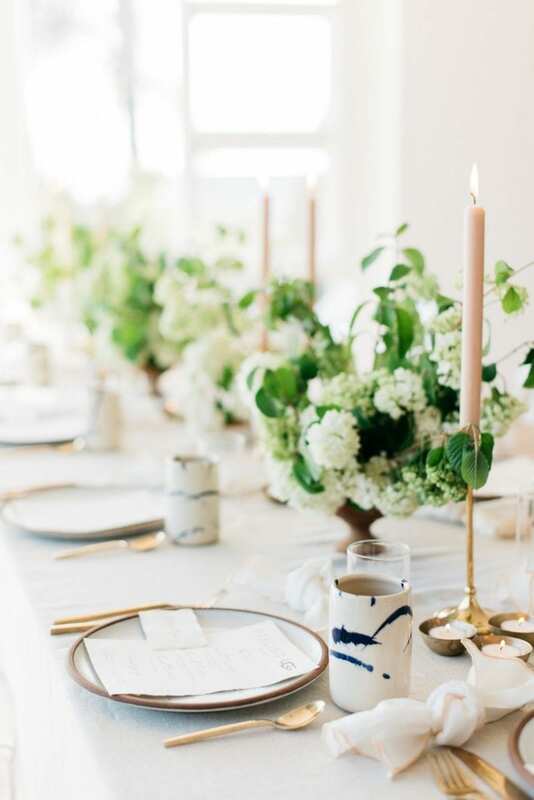 We took our seats at the table designed by Chelsea, each place set with The Hostess Haven dinnerware, Resource One linens, Chris Earl ceramic cups and and guests’ names written beautifully by Simply Rooted Calligraphy. I clinked my glass with a knife and we commenced the dinner! I started out by telling the story of Darling, how we began from a tiny spark of an idea funded on Kickstarter and are growing into a global movement centered around authentic, brave conversations on real beauty, genuine connections and reforming our beauty ideals from the retouched norm. UGG was our wonderful partner in hosting the event and it was fun to revisit their West Coast heritage in the gorgeous Hollywood Hills. The company founded in the 1970s on the shores of Southern California took the fashion space by storm with their iconic Classic Boot. Growing beyond cold weather essentials, they have amazing sandals, athletic shoes and even other boots that might surprise you when you think of the household name. Dropping the “Australia” from their logo just last year, UGG is focused on getting back to their roots by re-exploring their rich California story. I was surprised at the depth at which all of our ladies all engaged: Debby Ryan, Jeannie Mai, Arielle Vandenberg, Ireland Basinger Baldwin, Hanalei Reponty, Charm La’Donna, Courtney Barry, Raquelle Stevens, Madeline Hill, Nola Singer and women from the Darling and UGG teams. As the main course arrived, I thought it was time to move on to Question #2, but everyone was still in deep discussion over Question #1! No need to rush when you have plates of crispy broiled wild-caught salmon over cauliflower rice with preserved Meyer lemons, mint, pistachios, and avocados from JJ’s Lone Daughter Ranch. The beauty of it all was that phones were tucked away, eye contact was free and lasting friendships were being made. No awkward moments of wondering how best to finish food and cut small talk to a minimum. Again I was surprised and honored at the honesty each woman met the group with. It never ceases to amaze me how much comfort and courage can come out of just setting a time for a good meal, earnest conversation and all distractions tucked away. Special thank you to all our vendors and Darling interns Kailey Toro and Lauren Franklin! Love the topics you covered, and the photos are so gorgeous! Seems like such a great evening!